A disco ball video loop that's shiny and positive, this video loop makes for the perfect video background. The perfect addition to your video footage library. ⓘ The DXV MOV (Resolume) and PNG Alpha MOV versions of this video loop have a transparent background (not black like the video preview). Video preview shown at low quality. There's no Free Loops logo on the video file. 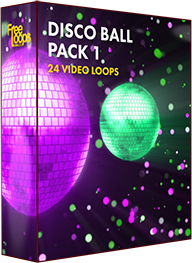 This video loop is part of Disco Ball Pack 1.